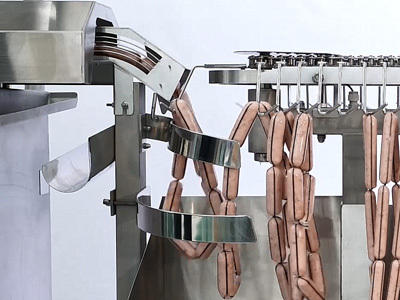 The features of a required Sausage Linking is high spead production, accuracy of stuffing weight, reduction of problems during stuffing, easy product changeover, high durability, simple to repair when problems occur, are requirements of the sausage linker. To upgrade these features, Hitec's next suggestion is to control the pump drive by the servo motor. All your necessary information displayed at a moment notice,quick and easy. 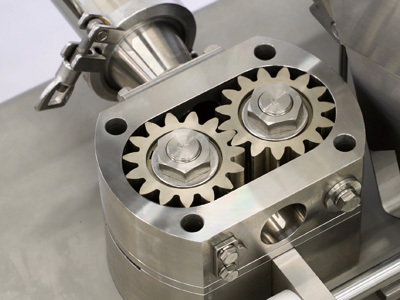 HITEC has achieved to make heavy duty metering pumps by stronger drive shaft, stronger idler shaft and more durable bearings. Our design offers excellent long term weight control with less necessary overhauls. 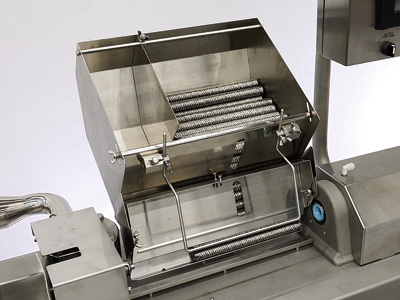 By using the stationary chute, no more products will be jammed at the chute section. 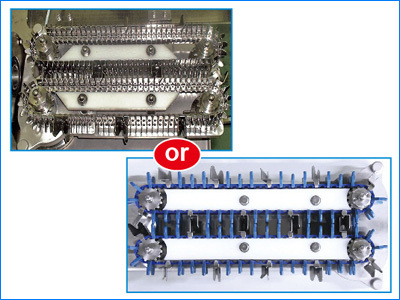 Due to HITEC’s innovation with electoric conveyors, a looping horn is not needed. Sausages are caught by the hooks. 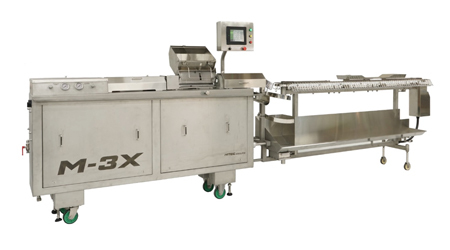 Several other features enable us to maximize output and hanging ability. A simple motor with timing belt means fewer components and extended parts life. When necessary,replacing parts is done quickly and easily without the need to remove the entire twister assembly. No one can match the performance of this HITEC design. The HITEC M-3X features HITEC's unparallel hopper design that eliminates the need for a casing clamp. 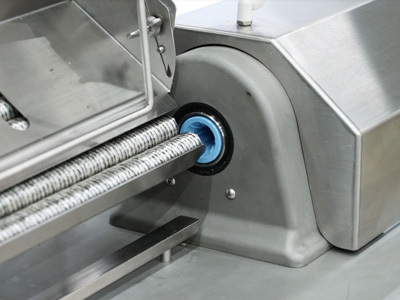 The design is quick and easy operating and reliable feeding of casings. Linking Chain : Available in various lengths from 3 pitches (28.56 mm), as well as half pitch (4.76 mm). Also capable of straight stuffing (no twist). Linking Belt : Pinchers that are attached on the linking belt fix the product length. Customers can choose the product length from 2 cm and in units of 0.5 cm. ※The figures shown above may change depending on the product,plant condition,local requirements for power and/or other respective matters. ※Longer sizes can be applied with HITEC'S optional unit. Cellulose casing code 13 through 36. ※ Specifications and equipment are subject to change without any obligation on the part of manufacturer. 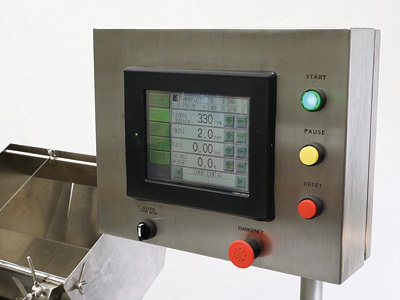 ※ The above production rate is subject to change due to the conditions such as production item, factory and other conditions. 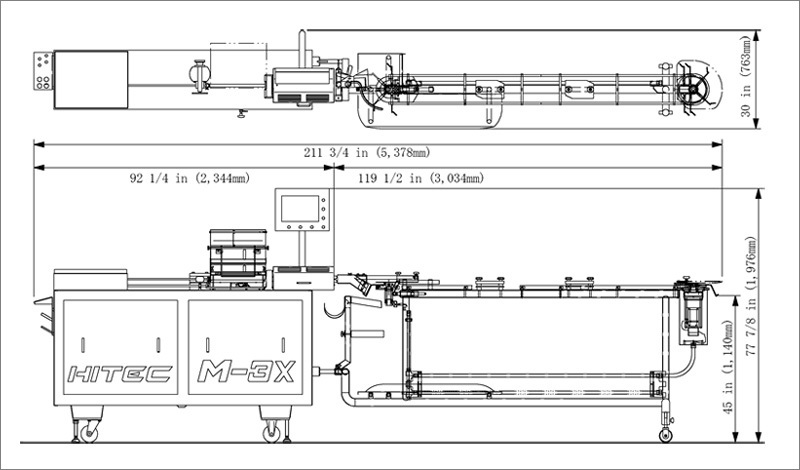 ※ Layout dimension includes dimension of optional equipment.